Kapama Private Game Reserve occupies a vast area between the northern Drakensberg mountains and the Greater Kruger National Park. It is the largest single-owner game reserve in the region, and is perfectly situated to receive guests flying into Eastgate Airport (Hoedspruit). 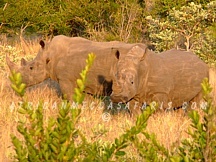 Kapama Game Reserve, in Limpopo Province, is an area renowned for superb safari vacations. 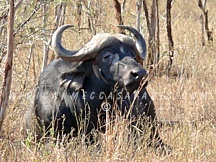 Kapama's 13000 hectares has all the big game of Africa with 42 mammal species and approximately 350 bird species. 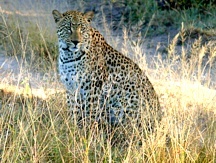 This equates to huge natural diversity and includes the famed 'Big 5' - lion, leopard, elephant, buffalo and rhino. Game drives are conducted through the rolling savannah grasslands and riverine forests that make up this appealing African reserve. Two daily game drives are part of the fully inclusive tariff and your skilled ranger and tracker do their best to find the animals of Africa for you to admire. Expect a wake up call at between 5am and 5.30am and gather for tea or coffee and rusks before heading out at first light. If you are lucky, the big cats will still be around after their night of hunting. This is Big 5 country (Lion, Leopard, Elephant, Rhino and Buffalo) all of which are possible to see during a two-day safari in Kapama Game Reserve. There are also many other species to be seen, large and small, as well as fascinating plants and colourful birds. Stop halfway through the morning game drive for hot drinks and rusks from the Landrover snack box and return at around 9am for breakfast. During the rest of the day, you are likely to see wildlife like nyala antelope and vervet monkeys around the lodges. At about 3.30pm everybody convenes for high tea, before departing with the same ranger/tracker team for the day's second African bush safari. Enjoy a sundowner drink along the way (not included in the tariff), and get out of the vehicle to stretch your legs and watch the sun go down over the distant Drakensberg Mountains. As darkness descends it's time to return to the safety of the Landrover and let the tracker scan the landscape with a spotlight picking out the glinting eyes of nocturnal animals. Return to the lodge at around 7pm, where there is time to freshen up before dinner. Get some African soil under your feet with a bush walk after breakfast. Explore the environment with your ranger, learn about curative properties of plants and identify animals from their footprints and dung. Large game is avoided when on foot but animals can often be seen from a safe distance. This is an once-in-a-lifetime opportunity here in Kapama Game Reserve to ride on the back of an African elephant. Meet the herd in the early morning or late afternoon and learn just how to get onto the back of an elephant and move to its rhythm as they walk through the bush. Elephants need to feed for many hours a day, so just because you are on top, this doesn't stop them from pulling down branches and grabbing a trunk full of grass as they walk. 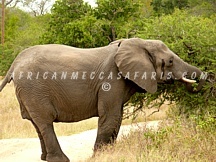 They are the largest creatures in the African jungle so other animals that you may come across will g ive way to you. After walking for about an hour, the elephants will return you to the elephant boma. Kapama Game Reserve had its origin in 1986, when the late Johann Roode purchased his first property in Hoedspruit called Moria farm. The name Kapama originated from a small railway station across the road and it is believed that Kapama was the name of a chief of a local tribe that lived in the area of Thulumahashe. The Moria portion of Kapama is where Kapama Buffalo Camp is positioned today. Johann decided to graze Bonsmara cattle on this newly acquired property but soon required more land for the increasing herd. Another portion of land known as Drakensig was bought and this is the where Kapama River Lodge is now situated. Cattle farming proved to be uneconomical; the environment was harsh and predators and tics took their toll on the cattle. In 1987 Johan realised that eco-tourism was the only way to sustain this large property. So in 1989 Kapama Lodge was constructed and this was beginning, of what would in time, become one of the leading eco-tourism destinations in the world. More land acquisitions followed and Kapama has grown to be the biggest single owned Private Game Reserve in the lowveld safari region of South Africa. In 2002 Johan Roode tragically passed away at the early age of 58 after contracting pneumonia. Johann's wife and mother of their two children Bernard and Adine, took over the management of the Kapama business and completed the building of the super-luxurious Camp Jabulani on the Kapama Game Reserve in 2003. The Roode family decided to re-allocate responsibilities and the Kapama business was divided in two sections. Mrs Lente Roode and her daughter Adine continued to manage and operate Camp Jabulani as well as the world renowned Hoedspruit Centre for Endangered Species. Johann's son Bernard, took control of the other Kapama Lodges. In the tradition of the father, more land was acquired with the last addition to Kapama being a 600 ha portion alongside the Klaserie River, to the north east of the reserve. To complete the full range of accommodation on Kapama Private Game Reserve, another lodge was built in 2005. This is the acclaimed and exquisitely designed Kapama River Lodge on the edge of the Kapama River. But that's not quite all, they realised there was just one thing missing for the real romantics who come to Kapama on honeymoon or for a special occasion! In 2007 they built a Romantic Sleepout Platform far from any of their other safari accommodation, and set it up so that a couple could sleep at treetop level under the stars on a four poster bed lit by lanterns. This is proving to be the coup de grace of Kapama and a romantic safari experience like no other. Now, Kapama's portfolio of exclusive safari lodges offering the best range of safari accommodation in South Africa is complete.